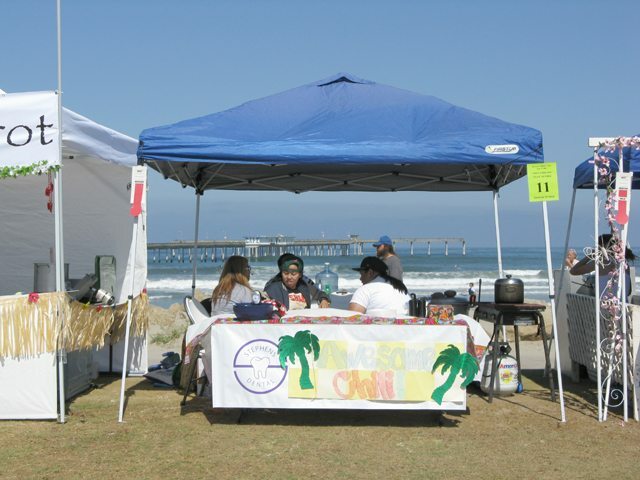 A Hot (Chili) Time in OB – The Winners! It’s that time of year again when things really heat up in OB. It’s the Annual Chili Cookoff. It was another perfect day, the kind of day we take for granted in OB. But the heat wasn’t in the air. It was inside the bubbling kettles heating up over propane flames. Not many foods can give you the same rush as a bowl of hot chili. The sting of the heat and the pleasure of the savory taste combine for a sensory explosion with every bite. You take a big spoonful of chili, your mouth starts to burn with quick heat, your head sweats and your eyes water, then the afterburner kicks in with the delayed creeper heat, you grab for a gulp of something cold, catch your breath, then you do it all over again. Deadly good stuff. 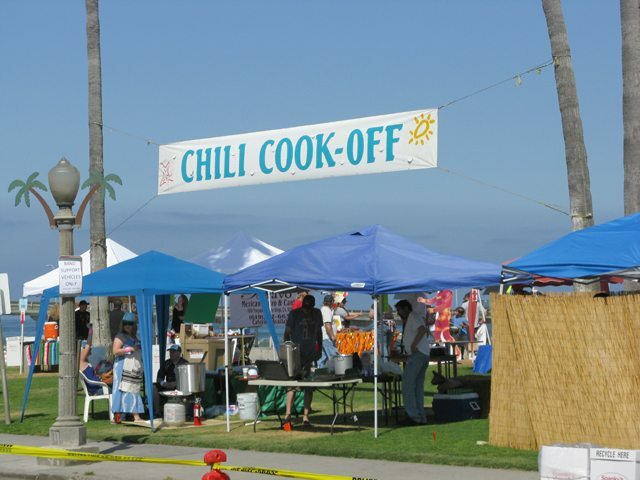 The Chili Cookoff took place at the lawn on Abbott Street just south of the Lifeguard Tower. 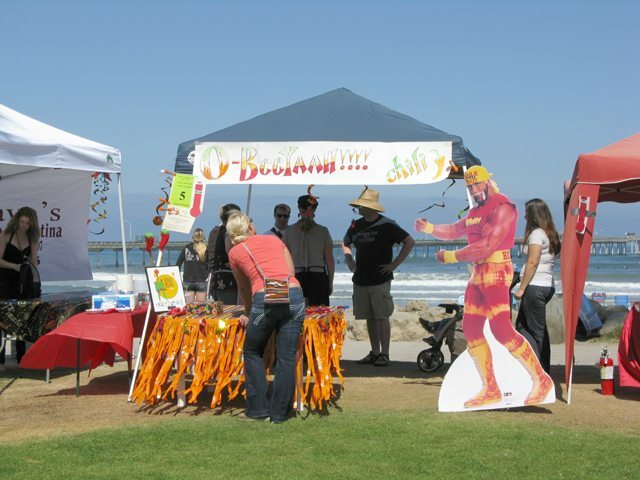 There were about 25 booths set up around the perimeter of the lawn. The booth designs ran from plain to fancy and everything in between. Walking around as the chili cooked, the aromas were incredible. I spoke with some of the teams before the tasting started at 11:00. As soon as the tasting started, long lines started to form and the crowds moved in. At some point, it was hard to tell which line I was in, but it didn’t matter, it was all good. The chili that I tasted was all very good, not a dud in the bunch. There were a variety of flavors and textures and styles. 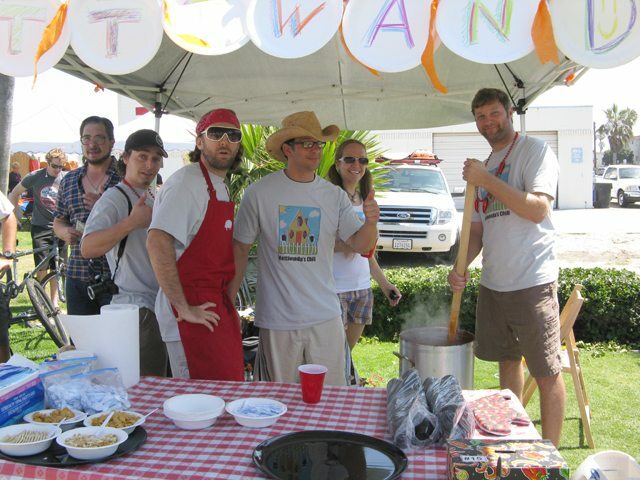 A few teams had both vegetarian and meat versions of their chili. (Being a carnivore, I chose the meat.) One thing that surprised me was that none of the samples I tasted were excessively hot. All had a nice, pleasant “zing” to them. They ranged from mild to what I would call medium heat, but none sent me frantically grabbing for water. By around 1:00 some of the teams were starting to run out of chili and the crowd began to thin out. About that time my tastebuds were starting to cry Uncle, so I gave them a break. I couldn’t get into the Beer Garden with my backpack, so I went for a large lemonade at the foot of Newport and walked out the pier. The winners were announced at 4:00 at the pier stage. By then I was getting tired and sunburned and craving a beer, so I walked back home. It was one of the most enjoyable days I’ve had in a long time. Representatives from the Health Department were on site to make sure the chili was kept hot enough and prepared under healthy conditions. I spoke with Saul and Steve. They described their chili as traditional, simple and “Spicy enough that you keep on craving it”. They have been using this recipe for 12 years after they developed it over 20 years in the restaurant business. They said that their chili is unique because of the special preparation and the meat they use. The recipe originally came from Tim’s grandmother. Wes told me that his chili is a fusion of Texas and San Diego. He uses hickory smoked meats, barbecue sauce, zucchini, eggplant and vegetables. I sampled Wes’ chili. It had a distinct barbecue flavor that was unusual for chili, but very good. It had a lot of tender meat and a delayed heat. I didn’t get a chance to talk with the team, but I sampled their chili. It had a good smoky taste, thick and flavorful. It contained beans. I spoke with Freddy. They use some ingredients that are unusual for chili, like cocoa, vanilla and cherry. This was a first-time recipe for them, and it turned out great. When I tasted the chili, it reminded me of mole (the Mexican sauce, which I love). It was sweet and savory, thick, chunky and had beans. The heat was moderate. Kelly told me that she used a family recipe, and she wouldn’t say any more. The chili was made with a combination of spices and a lot of love. She has been making it for 2 years. Lindsey described her chili as mild, not too spicy, with three beans and beef. They took an old family recipe for tacos, and converted it to chili. 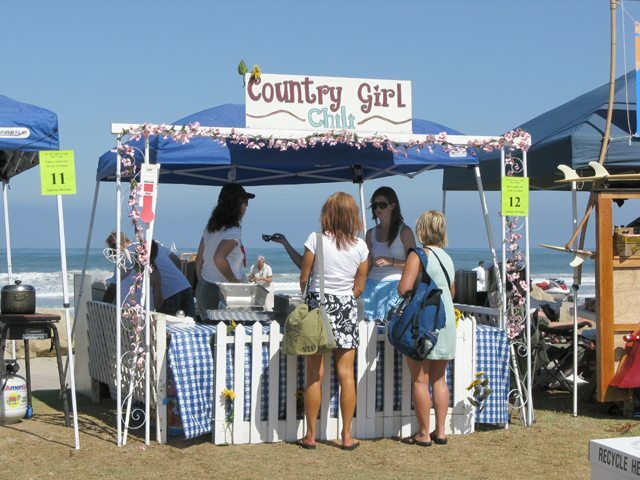 They are an all-girl team from El Cajon, hence Country Girl. These folks definitely had the coolest booth design, an old-fashion surf woodie complete with surfboards. Mike and Erin told me that Karl Strauss Woodie Gold goes into the chili. The recipe came from Erin’s head. I sampled the chili, it was slightly sweet, almost fruity tasting. It had a medium delayed heat. Jan told me that she uses tangy steak sauce in her chili, and organic vegetables fresh from the garden. She made up her own recipe and has been making it for eight years. 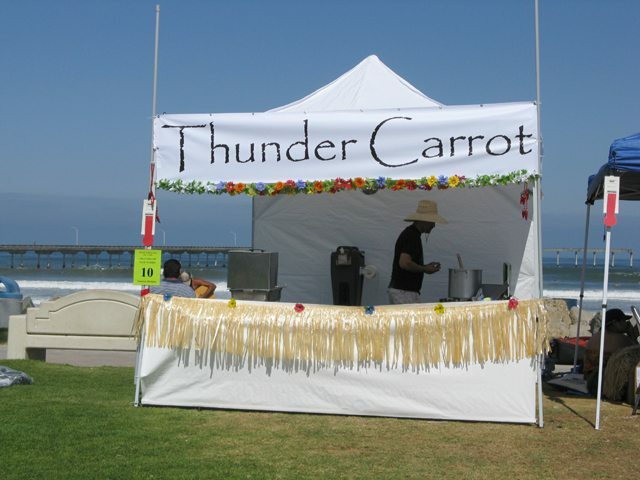 This was definitely the party booth. These folks seemed to be having the most fun of anybody there. Steve, the team’s “Chili Master” told me that they use five kinds of chili peppers, two kinds of meat, and stir it with a birch paddle. It was made fresh onsite. The booth was made with 100% recycled materials. I tasted their chili. It chili had a very tangy taste, a good overall flavor and texture, with beans. It had a medium delayed heat. Dan told me he makes both meat and vegetarian options. He uses pureed vegetables, beef and sausage. He has been making this chili for two years from a recipe that evolved from a former roommate’s recipe. When I tasted the chili, it had a strong flavor of red chili peppers. It had a smooth sauce with chunks of meat, like a competition chili. Brock and Katie told me they make their chili with smoked pork and tri tip. Their chili recipe started with poker night. I tasted the chili. It had a very good traditional chili flavor with a definite taste of cumin. The meat had a good smoky flavor. 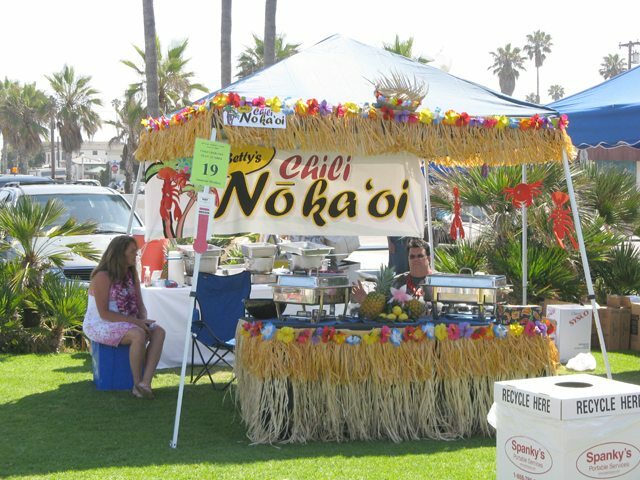 Betty told me that “Noka’oi” means “Great” in Hawaiian. She described the chili as “Dancing on your tongue”. The chili is made with shredded pork, verde sauce and green tomatoes. The recipe was created for this cookoff. When I tasted the chili, it had a good savory flavor of mild green chili peppers. It was mild, not hot. Glenn told me that his chili is made with meat that is hormone free and steroid free, and free range chicken. The recipe came from his grandmother, who started making it way back in 1921. I spoke with Chris. He said he uses different spices including Saigon cinnamon, six fresh chili peppers and six dried chili peppers. It is a true competition chili with no beans. 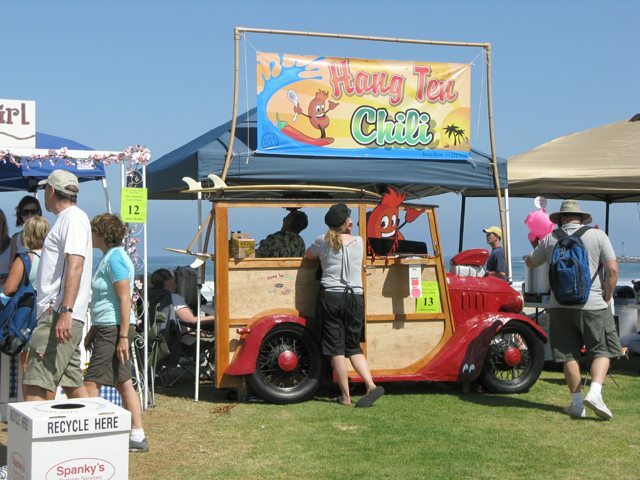 The taste was very unusual for chili, both sweet and savory. It had just enough medium heat. Chuck told me that he uses stew meat and fire roasted chili peppers in his chili. It takes lots of time, he started chopping meat on Wednesday and started cooking the chili on Thursday to be ready for the cookoff on Saturday. He has been making his chili since the early 90’s. All in all, some pretty impressive chili and a lot of culinary talent. Of the chili I tasted, there was not a bad one in the bunch. Again, my apologies to the people I missed. Mayor Jerry Sanders was there serving up chili. Thanks go out to all these folks who took time out of their busy schedules to be there. 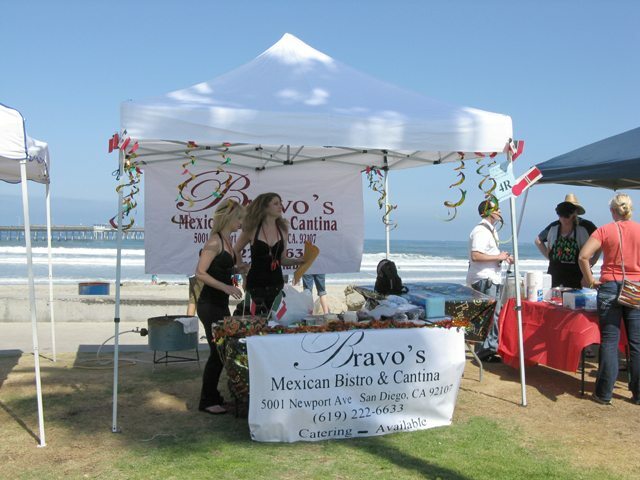 And let’s not forget to give a shout out to the restaurants that entered the Chili Cookoff. Stop by these restaurants for a bowl of the good stuff. And a personal thanks to the folks at OB Mainstreet Association for getting me the information I was missing. You rock! did ya need the ice cream? if not, can i have it? lol. thanks for the coverage. I’ve always wondered what happened and who the winners were. Now, I know, thanks for the very complete report wireless mike. Wow – what a mob scene. The ladyfriend and I showed up a bit early, bought our People’s Choice passes, and took off to kiddie Wonderland for an hour or so. Bad idea, by the time we got back around 11:45 the lines were crazy. It was still fun milling about, trying to figure out what exactly we were in line for (I feel lucky to have guessed correctly every time and not waited in the same line twice). But alas, a kindergartener’s attention span is limited, and I only had about ten or so of the entries. All good, most unique, none really spicy, few that I’d actually call ‘chili,’ – but like Mike said, that’s the OBecian side of the event, who says we’ve got to follow ‘rules?’ I talked to my buddy’s uncle Sam, one of the official tasters, he seemed to share pretty much the same sentiments. Looking forward to next year, when I’m gonna be sure to be on hand right when the green flag drops at 11.